The story of events in Scotland in the two centuries or so which followed the Treaty of Northampton makes depressing reading. Ill-wishers are given ample reason to sneer or to deride, and Scots themselves may well feel that the conduct of their countrymen during those generations justifies the national inferiority complex. The events are melodramatic. Two kings murdered; two killed on the battlefield; an heir to the throne thought to have been murdered by his wicked uncle; two kings made prisoners of war, and subsequently ransomed; noblemen turning to treason, and kings stooping to judicial murder; kings kidnapped and used as instruments in the schemes of greedy and ambitious politicians - with such a tale of horror and catastrophe it is not surprising that while specialist students of the period may understand many of the issues, the general observer is likely to be left with a confused and irritating picture of the times. Many things which happened were disgraceful and even more were pitiful, but there were reasons for them all. For instance, at this stage of political sophistication, the personality and capacities of the king were of the greatest importance in determining whether the country would prosper or decline. Of the eight kings who followed Robert Bruce who died in 1329, only two were adults, and both had their limitations. David II was five; James I was twelve; James II was six; James III was ten; James IV was fifteen and James V one year and a few months old. At regular intervals, therefore, the Scots endured lengthy royal minorities, and the consequent need to find suitable regents or guardians. In such circumstances competition for power, and the formation of political factions among the powerful, are all too probable. Also, there were moments when the freakishness of the hereditary principle worked to the country's disadvantage. It was in retrospect for instance, rather a pity that Bruce had a second marriage and a male heir in the person of David II. If Thomas Randolph had been, not guardian, but king, in 1329, things might have gone rather better than they did. Or again, if Robert II had been succeeded by his ablest son rather than his eldest, the nation would have been spared Robert III and the wretched experience of his rule. So, recurring minorities brought rivalries, but rivalries were bequeathed to Scotland by Robert II. He had married twice, and fathered twenty-one children. Each son and each son's descendants carried ambitious feelings, and there lingered for several generations a potential for trouble, as the families deriving from his second marriage returned every so often to the assertion that his first marriage was unlawful and its heirs therefore illegitimate. For his many daughters Robert had to find husbands, and he thus drew close to the royal family by marriage many families which might better have been kept at a safer distance. In addition to this company of royal and semi-royal aspirants to power and place, there were also families whose ambitions sprang from their vast estates which conferred upon them great wealth in rentals and great strength in the number of their tenants who could be soldiers in their lord's interest. Two families in particular bedevilled the state - the Douglases and the MacDonalds of the Isles. The Douglas power had honourable beginnings in the contribution of Bruce's great captain Sir James, and none would feel resentment or surprise that lands were bestowed upon the family whose head had so deserved the respect of his countrymen and the generosity of his king. But Sir James died soon after his master, carrying Bruce's heart into battle against the Saracens in Spain; and his successors, inheritors of great possessions, did not necessarily share his qualities. Through time the main line of the family - the 'Black' Douglases - became intolerable to the crown in their power and their arrogance and were crushed by murders, battle and eventually forfeiture of their lands. But a branch of the family - the 'Red' Douglases - became Earls of Angus, and long survived to make a nuisance of themselves. The MacDonalds - especially those based in Islay - were the heirs of the semi-independent Lords of the Isles looking back to the great half-Norse half-Gaelic Somerled as their ancestor. The Lords of the Isles had ruled as virtual monarchs, and had prompted many Scottish kings to mount campaigns against them. The MacDougalls had lost their power through their backing of Balliol against Bruce, but the other line of Somerled's heirs, Clan Donald, remained proud and powerful. There was, of course, one remaining menace to Scotland and her rulers - England. English recognition of Scottish independence had been grudging and totally insincere, and thus England's kings took every possible opportunity to benefit from Scotland's recurring misfortunes. They were able to inflict upon the Scots a succession of disastrous defeats, which the Scots were able to survive only because from the 1330s onwards, England became embroiled in the Hundred Years War with France, and later in the civil wars of the Roses. But defeats like Dupplin Moor in 1332, Halidon Hill in 1333, Neville's Cross in 1346 were fit to rank as Scottish disasters with Dunbar and Falkirk. So, weakened by internal faction, which English kings fostered and used to the fullest possible extent, Scotland stumbled through the generations, never conquered, but constantly weakened, held together by some luck, occasional competence from her kings, and the commendable loyalty of some of the nobility. The one moment upon which later generations could look back with any real pride was the brilliant reign of James IV which ended, in the best Scottish tradition, with the most heart-rending of national tragedies. No one could have foreseen that the boy of fifteen, who came to the throne as a result of a rebellion against his father, in which he himself had participated, would become the king of Scots most brilliant in the judgement of later generations. David I and Alexander III are, in comparison, rather shadowy figures, and Robert I's fame is bound up totally with the winning of independence. James's career we can study, from its beginning to its end, and he emerges from scrutiny as a man possessed of all the qualities which would ideally be found in a leader. As skilled an administrator as James I; as alert and lively of mind as James II, and as cultured as James III, he had all the good points of his predecessors and showed none of their defects. He was free of the cruelty which demeaned James I; he lacked - until the very end of his life - the impulsiveness of James II, and he had the dignity and self assurance which his father so damagingly lacked. Once old enough to devise his own priorities he moved to establish royal authority in the Highlands and Islands once and for all. James, perhaps initially with seaborne trade in mind, had Parliament pass a Shipping Act, requiring all coastal burghs to build twenty-ton ships in the national interest. Between then and 1506 James led several expeditions into the Hebrides, compelling the submission gradually of the MacDonalds and the lesser chiefs who had obeyed them. John of the Isles submitted in 1494, and ended his days as a monk in Paisley Abbey in 1498. The entire ruling family of Islay resisted unwisely and were captured and executed - father and four sons - in 1494. 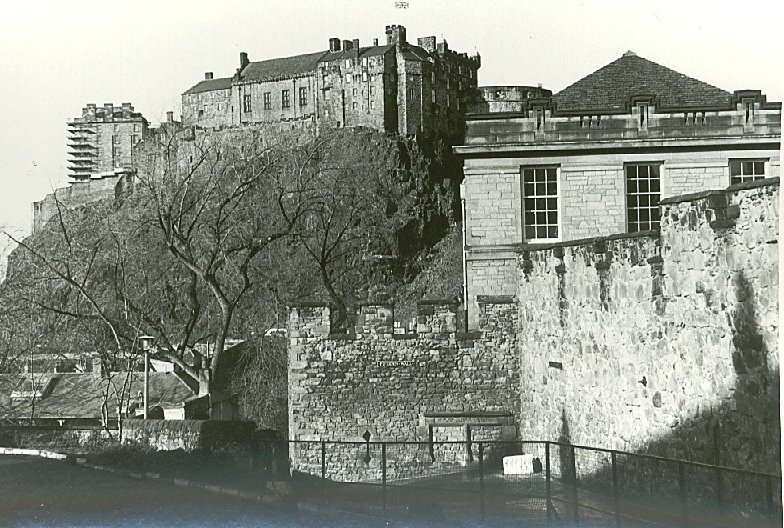 The last resistance ended in 1506, and Donald, last claimant to the 'Lord of the Isles' title, remained a prisoner in Edinburgh castle for almost forty years. These expeditions had shown the importance of naval power, and revealed the good fortune which James enjoyed in having the services of famous and brilliant sea-captains like Sir Andrew Wood of Largo, and the three Barton brothers, all of whom enjoyed a reputation extendis not the Sir Andrew Wood's Tower, Upperng throughout Western Europe. Building upon his success James arranged for the construction of what was virtually a Scottish Royal Navy, the flagship being the Great Michael, a giant among ships of its time. According to tradition all the oak trees in Fife were felled to provide for the Great Michael's building, and under the command of Sir Andrew Wood the fleet became for James a source of great pride and satisfaction. first king to use such a method, but the consequences of James's plan were to endure into modern times. His chosen instruments were the Earl of Huntly, head of the wide network of landowners of the Gordon family, whose power base was in the north-east; and the Earl of Argyle, head of an even more impressive array of Campbell chiefs in the west. 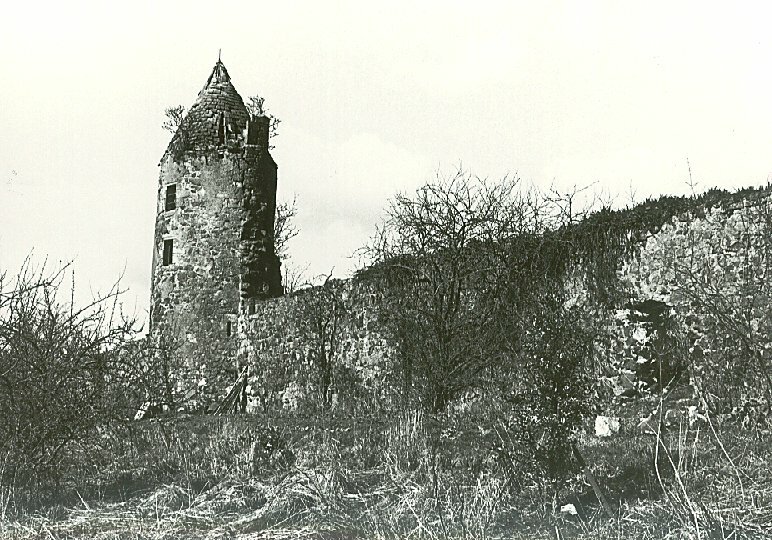 The Huntly family had been traditionally royalist and loyal; the then Earl had given vital help to James II against Douglas allies in the 1450's, and in 1488 Huntly had fought for his king, James III at Sauchieburn. The loyalty of the Campbells went back even further to the days when Sir Neil Campbell of Lochawe chose to serve and follow Robert Bruce, and founded the family fortunes in so doing. So in the north-east and north, the Gordons acted for the crown; and in the west it was now the Campbell galleys and Campbell military power which was crucial. The pacification of the Highlands and Islands complete, James imposed order similarly in the Borders, and good order for the future was to be guaranteed by a revised legal apparatus involving a more or less permanent Law Court in Edinburgh, and by regular tours of justiciars in support of local sheriffs in areas judged to be in need of such supervision. James appears to have appreciated the advantages of involving a wider proportion of his subjects in public affairs, and he gave new importance to Parliament, requiring freeholders in the shires and merchants in the burghs to participate in selection of representatives and, if themselves selected, to undertake the obligations of parliamentary business. Peace and order achieved, James sought to enhance the economic strength of his country. The long wars with England, though not destroying Scottish independence, had gravely injured the Scottish economy, as English invaders or retreating Scots burned and destroyed crops and property at times almost annually. It has been asserted that Scotland was economically stronger in the days of Alexander III than in the days of James III. Now James and his advisers acted to reform the currency, to impose standard measures of weight and volume, all to inspire greater confidence in Scottish commerce. An export trade was fostered with the establishment of a Scottish base, or 'staple', first at Middelburg and then at Veere (or 'Campveere') in the Netherlands. Domestic efficiency and commercial improvement enhanced Scotland's influence abroad, and under James, Scotland came to enjoy diplomatic importance. Scottish support was given to, and welcomed by, Denmark under pressure from Swedish enemies; to Guelders, against the Hapsburgs of Austria and, of course, to France, enemy of England and England's allies, Spain and Austria. In 1509 the English crown passed to Henry VIII, the antithesis of his father - romantic, over-bearing, and emotional, and a much more dangerous neighbour. Relations between England and Scotland rapidly deteriorated. English ships attacked Andrew Barton at sea, alleging piracy, and Henry was cold in his rejection of James's complaints. In 1512 Henry, with his Spanish and Austrian allies in the so-called 'Holy League', attacked France. James renewed the alliance with France, but seems to have hoped to mediate rather than fight. But skirmishing began along the Border; French defeats occurred, and the French queen, who knew her man, appealed to James's romantic and chivalrous streak, sending him herring, and asking him to 'break a lance' in England for her sake. This misguided vision of himself as a knight, upon whom damsels in distress might call for aid, was the fatal flaw in James's character. All his previous skill and experience were set aside, as his honour was now appealed to. He called his army to muster on the Burghmuir of Edinburgh and their response testifies to James's work in uniting his country. From all parts of his country, and from families often in past conflict with one another, they came to his summons. With perhaps the largest Scottish army ever assembled, James crossed the border, captured key English strongholds and awaited the oncoming English army under the wily veteran, Surrey. 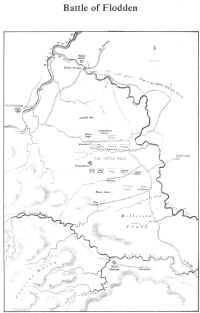 As the armies came in sight of each other on 9 September 1513, James committed the deadly error of allowing Surrey to place his army between the Scots and their road back to Scotland. 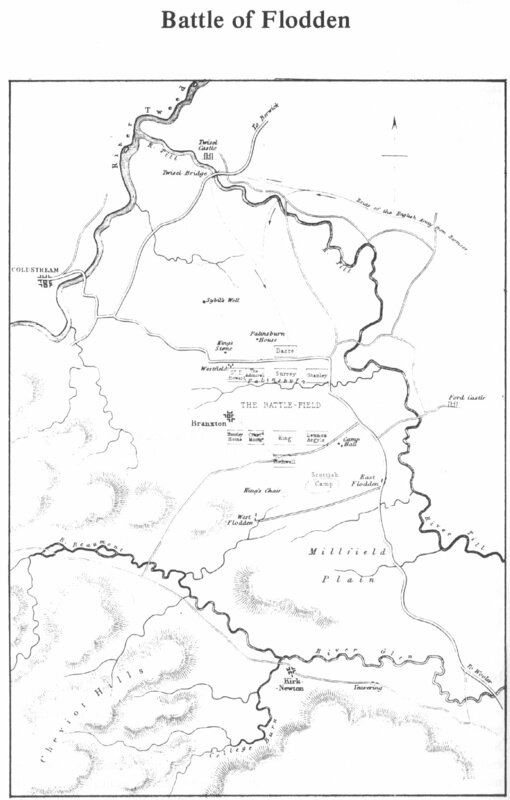 His final error was to order the Scots to leave their position upon Flodden Hill and toil over marshland to attack the English. Superior technology again was decisive, not archers this time, but guns, and the English infantry armed with 'bills' - short spears with axe heads on their shafts. With their bills the English broke the Scottish spears and were able to close in upon the tight Scottish ranks. The Scottish right, under Argyle and Lennox broke; the left, under Huntly and Home were victorious, but pursued their beaten adversaries, allowing Surrey to close in upon the king and the Scottish centre. There King James died with an English arrow in his throat and a bill wound on his head. Around him lay twelve Scottish Earls; his young son Alexander, Archbishop of St. Andrews; fifteen lesser lords and clan chiefs, and several thousand of his countrymen. They fought on till darkness fell, and then made for the Tweed and home. The road to Edinburgh lay open, and the city authorities learned of the disaster from Randolph Murray, captain of the Town Guard who had gone to Flodden and alone had survived. Never was there such a disaster. Hardly a family in Scotland had escaped bereavement, and a whole generation of leaders had died in one afternoon. The new king, James V, was aged eighteen months. Edinburgh's city leaders hastily built the Flodden Wall, and prepared to endure English attack, but the victory at Flodden had not been without cost, and Surrey was not in any position to press home an attack upon Scotland. So the crisis passed, and indeed an age had ended. Future English attacks would be made with some precise purpose, and no longer in any general pursuit of conquest, overlordship and the like. Things had changed in both countries, and the old medieval social patterns had begun to change with them. In the mid 1400s there had occurred the beginnings of that remarkable process which men came to know as 'the Renaissance', when the marvellous capacities of the human mind seemed to be released and respected as never before in Western Europe. It was not perhaps really as new as it seemed. Many profound thinkers had lived and expressed themselves all through the medieval centuries, but now there was an excited feeling that man's own intellect was a marvellous gift; and that using it he could examine and understand his world for himself. The natural world of science and geography was appraised in this manner; the function of literature and the arts was examined anew; philosophy as man's deepest intellectual activity was revitalised, in this new spirit of inquiry and experiment. Renaissance prince - versatile, intelligent, cultured and progressive. But of course, these developments were of significance mainly among the leisured classes. Study and reflection were luxuries denied to a general public, mostly illiterate, working daylight hours on the land. Their lives did not change essentially in the best part of a thousand years. Most people lived on and from the land. The entire feudal system, from highest to lowest levels, was based upon services performed in return for the use of land. The noble was bound to serve the crown as a soldier, and to bring with him tenants who were similarly bound to him. The wealth of all - crown, church and nobles - was based upon the produce of the land, worked for them by tenants. The land was worked in teams, carrying through all the processes of ploughing and sowing, reaping and threshing and milling, earning their own livelihood, and sustaining their lords by their rentals paid usually in the form of the produce of the season's work. In Scotland good, productive land was scarce, and every acre had to earn its keep every year. The 'infield' was the land which could bear a crop each year, it was ploughed and allocated, by lot and, probably, by rota, to each household contributing to the work. The 'outfield' was the land of inferior quality, which otherwise was used mainly as pasture or rough grazing. Productivity was not impressive. The old Scots saying 'ane tae saw, ane tae gnaw, ane tae pay the laird witha' testifies to the expectation of a threefold return - one third kept as seed for the coming year, one third to feed the people, and the remaining third to go in rent to the landowner. There were good years and bad, as always. Sometimes the produce of one harvest was consumed before the new harvest could be gathered, and people then had to scrape a living from wild plants, fish, and the like. Each year, as has been said, was a rehearsal for famine, and sometimes the famine came. Some animals at the end of each season, were preserved for breeding, and the others slaughtered, because there was not enough fodder to see all through the winter. Often the animals which had been spared were so weak that they had to be carried out to the fields when the new growth appeared on the grass. The 'lifting' became virtually an annual ritual. The slaughtered animals were salted, and the salt meat consumed as the winter dragged on. Scurvy afflicted those who made this their diet. In summer and autumn milk and cheese with meal and through time, peas and beans, gave a more balanced diet. Class privilege affected diet and health. The landowners kept pigeons, and allowed game animals - deer and hares - to live on their land. They thus had a supply of fresh meat throughout the year and woe betide the tenant who took one of these beasts for himself. Towns and villages developed as centres for the marketing of any surplus produce, and as bases for the various craftsmen whose skills were relevant to the land - smiths, masons, farmers, weavers for instance. Every village, every town, every city was built on some lord's land, and that lord could grant such privileges as he wished to the people of the town. This was commonly done by the granting of a charter - a document detailing the rights granted, and the obligations undertaken. These charters were proof of the bargain, and men realised fully the importance of legal proof. The men of the medieval centuries were notably concerned with legalities, and a notion of the fundamental importance of law was bred in them. To towns granted charters to hold markets and fairs there was applied the name 'burghs'. 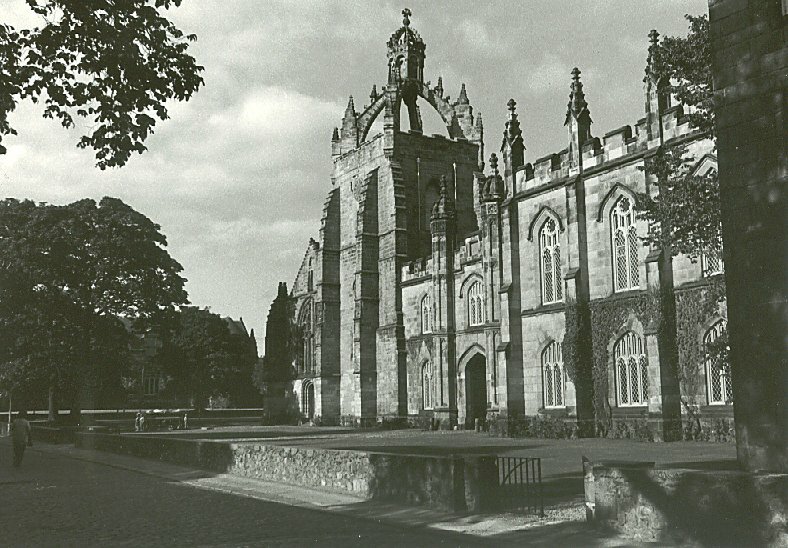 If a burgh was on church land - like Dunfermline or St. Andrews, Paisley or Glasgow - it was an ecclesiastical burgh, its charter coming from the Abbot; if on the land of a secular lord - like Greenock or Kilmarnock - it was a 'burgh of barony'; but if its charter came from the crown, it was a Royal burgh, with special rights and status. Royal burghs held a monopoly for instance in foreign trade, import and export, which no lesser burgh could infringe; and Royal burghs sent commissioners to the Scottish parliament. Kings saw useful political opportunities, and granted charters in areas where they knew themselves to be popular. Thus King James III gave charters to many of the small towns around the Moray coast, and James IV raised improbably small Fife villages to Royal burgh status. The Royal burghs were conscious of their superiority which they guarded carefully, and the Convention of Royal Burghs watched keenly for any challenge or any infringement. Within the burghs there developed Gilds, whose members pursued a common trade or profession. The craft gilds - Bakers, Wrights, Fleshers - regulated standards of work, licensed apprentices and disciplined craftsmen in the public interest. At a higher social and financial level there was one merchant Gild, organising all the overseas commerce of the town. Scots exports were very practical and showed the comparative poverty of the country. Salt and salted fish; wool and linen, hides and leather, coal - these were the products which found their way to the Netherlands, to Scandinavia and the Baltic, to France and most of all to England. England was the only country with which Scotland could trade overland, and the biggest single Scottish export, live cattle, went to England. In days to come, trade with Europe diminished and trade with England increased, and this dependence upon English custom had profound political consequences. Meanwhile the merchants prospered visibly. They imported fine fabrics, scents, spices, jewels and finely crafted metal, for sale to court and castle and, of course, for themselves and their families. The merchants were the sophisticates of their society, which made whatever international contacts it experienced through them. The burghs became, therefore, more cultured, more wordly-wise, more in touch with new ideas, than the rural communities, and increasingly influential in national affairs as time passed. 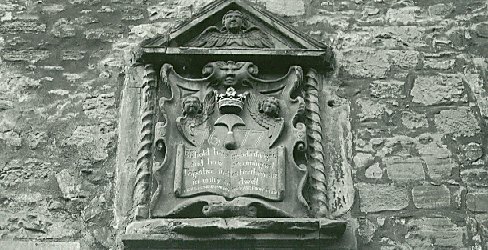 A Sculptured shield including the arms of the Guild of Shoemakers, Canongate, Edinburgh.